What a play! This was just a reading of Painting Churches, but it was so rich and so well done that it felt like a full production. Marian Seldes was Marian, that is to say simply brilliant. As Fannie, the mother, she had us eating out of the palm of her hand, laughing hysterically one moment and crying at the next. 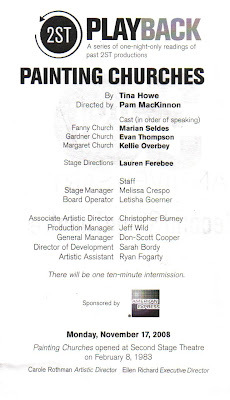 I enjoyed Kellie Overbey as the daughter. She has a lovely voice and presence. I completely fell in love with Evan Thompson as the father. He was so sweet and so funny. Tina was there to introduce the play - a play she opened 25 years ago at Second Stage. It was her first play to win a good review. In fact, Marian was in that original cast. What a funny person Tina is and oh my, can she write. The words from Painting Churches are still running through my mind. The house was packed mostly with patrons. Those of us with free tickets picked up at noon today were in row N or further, but the theatre is so great it didn't matter. Angela Lansbury was there too and was really the only luminary in the room besides Marian, of course. I've decided that I would like Marian to read me every evening.